At Bauma, AUSA will present its new 10-ton (22,000 lbs) dumper featuring reversible driving, as well as its completely updated range of all-terrain forklifts. Visitors to the Bauma trade fair will have the chance to discover the latest features that AUSA will present on its stand in the new C6 pavilion, which represent important advances in terms of the technological development of the sector and operational safety. After more than 30 years of continued presence at the most important exhibition in the construction sector globally, at the 2019 edition, AUSA is going one step further with its products and highlighting safety, technology and sustainability as its key points. This year, the main launch of the manufacturer of all-terrain compact industrial vehicles is an innovative 10-ton (22,000 lbs) dumper featuring reversible driving, hydrostatic transmission and a closed cab: the DR1001AHG. With this new dumper, AUSA is positioning itself as the segment leader in the area of safety. In addition to the rotation of the driver's cab, the dumper is equipped with a front camera, a fully closed ROPS/FOPS cab with heating, a seat belt buckle sensor, an audible reversing alarm, two rear-view mirrors and a safety grille. The driver's cab can handily rotate 180 degrees, providing a huge increase in visibility, which proportionally increases the safety of the operator and their environment. Furthermore, electronically it maintains the features introduced by the successful D601AHG, such as the ECO Mode, Smart Stop, Hill Holder, digital screen with all of the machine's information and integration of the telematic systems, which makes it the most advanced compact dumper in the market. 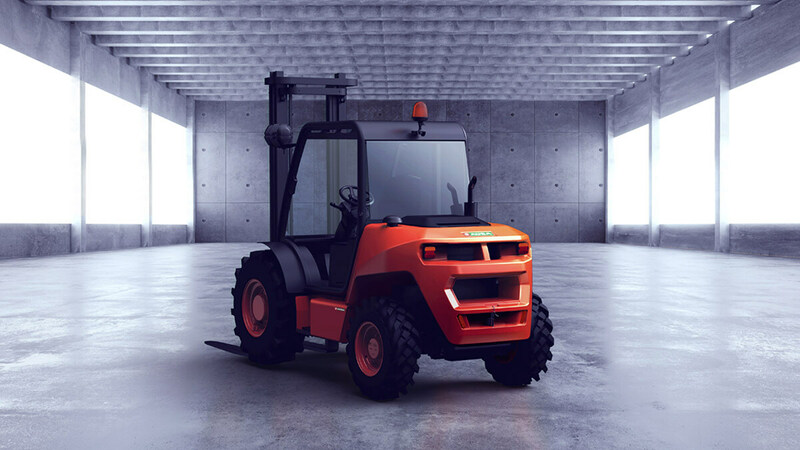 The other new item that AUSA will present at Bauma is the complete updating of its intermediate range of all-terrain forklifts with capacities of 2, 2.5, 3 and 3.5 tons (4,000, 5,000, 6,100 and 7,100 lbs). With an aggressive design and technologically advanced, the new forklifts feature a digital screen on the dashboard, just like a top range car, which provides the driver with all of the machine's information, with them being able to interact with the different screens via the same joystick that moves the mast. Thanks to its advanced software, it features a self-diagnosis system and is able to incorporate telematic systems. Efficiency is also one of its main strengths. Thanks to the ECO Mode system and Smart Stop, it manages to reduce fuel consumption and CO2 emissions. In terms of safety, the operator's visibility has increased by 30% and the Hill Holder system has been incorporated, which engages the brake automatically so that the machine can stop easily on any slope. AUSA comes to this edition of Bauma stronger, more technological, more efficient and with more solutions than ever for the safety of the sector. And all of this will be announced for the first time on 8 April in Munich, from its stand in the new C6 pavilion.